While writing up yesterday’s post I came across some interesting information that I figured I’d share because I wasn't aware of it, which is shocking because it's maple syrup news; the only thing more important up here is hockey. Although, fashionable toques is a close third. 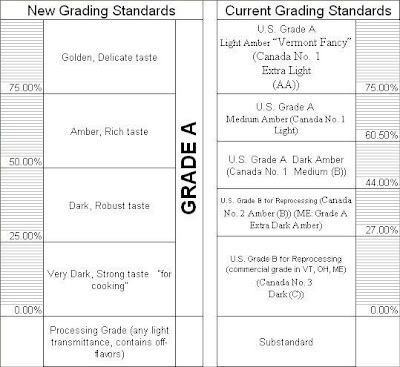 It appears that in 2012 the International Maple Syrup Institute (yes, there appears to be such a thing) is attempting to reclassify the grading system for Maple syrup for the 2014 production season. 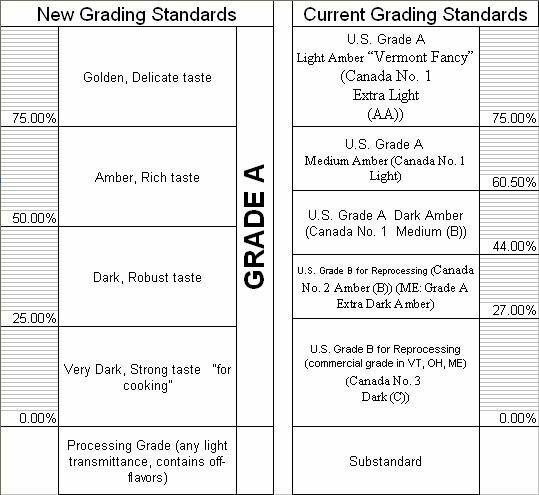 The new classification will unify the grading between Canada and the U.S. (who currently have two completely different systems) as well as take some of the stigma off of the No.1/Grade A vs No. 2/Grade B classification that makes the latter seem like an “inferior product”. The recommendation is to have two grades of maple syrup: a consumer grade, Grade A, that runs the gamut from Golden to Very Dark and a processing grade, which cannot be sold at retail. I suppose the ideology of keeping the “Grade A” naming convention is to lessen confusion should not all manufacturers adopt the proposed standards. However, it’s probably just as likely that it will confuse the bejeezus out of people, and even more likely that no one will notice. Now if only we can get someone to agree on a standardized weight for a cup of flour :). Interesting--I can see how the A and B distinctions can be confusing, given that they seem to imply lesser or better quality, versus different flavor. Kind of like how people assume that extra virgin olive oil is always the best because it is well, 'extra better' or something, even though it refers to the flavor, consistency, and processing of the oil. Also why 10 year old products still say "New" on them :).